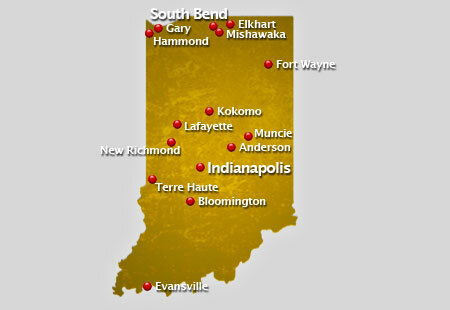 AirSign provides extensive aerial advertising coverage throughout all areas of Indiana. From beach aerial advertising to sporting events and over busy highways, we'll display your message to crowds in a way your audience will be certain to remember. Ranked as the 38th largest state in the United States, Indiana has a total land area of 36, 418 square miles. It is bordered by the state of Ohio in the east, Illinois in the west, Michigan in the north and Kentucky in the south. The extreme south of the state experience more rainfall than the other regions. Generally, Indiana has warm summers and cool winters. St. Meinrad Archabbey, located in Spencer County, Indiana, is one of the two archabbey in the whole state of Indiana and one of the 11 archabbey in the world. Another great feature of the state is the Admiral Raymond Spruance Memorial Basin found in Indianapolis. It is dedicated to Admiral Spruance for his expertise in military during the war againts Japan in World War II. There are a few colleges and universities in Indiana and mostly are affliated with religious groups. Such schools are the University of the Notre Dame, a Roman Catholic School, the Indiana University, the largest school and sanctioned as Indiana Seminary, and the DePauw University, affiliated by a Protestant. In matters of sports, the state of Indiana, historically, has some stories to tell. Indiana hosts the auto racing every May nicknamed as the Greatest Spectacle in Racing, making it the largest one day sporting event in the world. Also, if traced back, Indiana is where highschool basketball was born. Crowds are an aerial advertiser's paradise! A typical flight over popular events or locations can result in as many as 8,000,000 impressions! Have us fly your aerial banner over the crowds in Indiana to put your message wherever you want, whenever you wish at the best value in mass marketing!